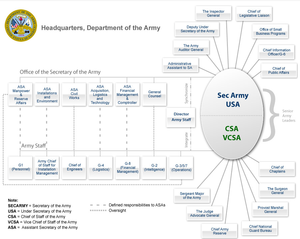 This page aims to portray the current overall structure of the US Army. Prior to 1903, members of the National Guard were considered state soldiers unless federalized by the President. Since the Militia Act of 1903, all National Guard soldiers have held dual status: as National Guardsmen under the authority of the governors of their states and as a reserve of the U.S. Army under the authority of the President. Since the adoption of the total force policy, in the aftermath of the Vietnam War, reserve component soldiers have taken a more active role in U.S. military operations. Reserve and Guard units took part in the Gulf War, peacekeeping in Kosovo, and the 2003 invasion of Iraq. Although the present-day Army exists as an all-volunteer force, augmented by Reserve and National Guard forces, measures exist for emergency expansion in the event of a catastrophic occurrence, such as a large scale attack against the U.S. or the outbreak of a major global war. The final stage of Army mobilization, known as "activation of the unorganized militia" would effectively place all able-bodied males in the service of the U.S. Army. The last time an approximation of this occurred was during the American Civil War when the Confederate States of America activated the "Home Guard" in 1865, drafting all males, regardless of age or health, into the Confederate States Army. During World War I, the "National Army" was organized to fight the conflict. It was demobilized at the end of World War I. In 1941, the "Army of the United States" was founded to fight World War II. The Regular Army, Army of the United States, the National Guard, and Officer/Enlisted Reserve Corps (ORC and ERC) existed simultaneously. The United States Army is made up of three components: one active—the Regular Army; and two reserve components—the Army National Guard and the Army Reserve. Both reserve components are primarily composed of part-time soldiers who train once a month, known as Battle Assembly, Unit Training Assemblies (UTAs), or simply "drills", while typically conducting two to three weeks of annual training each year. Both the Regular Army and the Army Reserve are organized under Title 10 of the United States Code. The National Guard is organized under Title 32. While the Army National Guard is organized, trained and equipped as a component of the U.S. Army, individual units are under the command of individual state's governors. However, units of the National Guard can be federalized by presidential order and against the governor's wishes. There are six geographical Unified Combatant Commands (CCMDs). Army Cyber Command is a component of United States Cyber Command. The commander of Army Cyber is also commander of Second Army. Second Army is now a direct reporting unit to the Army CIO/G-6, with CIO reporting to the Secretary of the Army, while G-6 reports to the Army Chief of Staff. Army Network Enterprise Technology Command/9th Army Signal Command (NETCOM/9thSC(A)), formerly reporting directly to the CIO/G-6, is now a component of Second Army. Corps: Formerly consisted of a corps headquarters and two or more divisions, corps troops (consisting of corps artillery, an armored cavalry regiment, an air defense artillery group, and an army aviation group), a corps support command (COSCOM) and other organic support brigades. A corps is now designated as an "operational unit of employment", that may command a flexible number of modular units. Usually commanded by a lieutenant general. 20,000–45,000 soldiers. Division: Formerly consisted of a division headquarters company, three maneuver brigades, division artillery (DIVARTY), division support command (DISCOM), an aviation brigade, an air defense artillery battalion, an armored cavalry squadron, and an engineer brigade, and other support assets. Until the brigade combat team program was developed, the division was the smallest self-sufficient level of organization in the U.S. Army. Current divisions are "tactical units of employment", and may command a flexible number of modular units, but generally will include three brigade combat teams and a combat aviation brigade, supported by a staff in a headquarters and headquarters battalion. Usually commanded by a major general who is supported by a command sergeant major. Typically consists of 17,000 to 21,000 soldiers, but can grow up to 35 - 40,000 with attached support units. Brigade (or group): Composed of three battalions, with a brigadier general or a colonel as commander, supported by a staff in a headquarters and headquarters company. Maneuver brigades have transformed into brigade combat teams, generally consisting of three maneuver battalions, a cavalry squadron, a fires battalion, a special troops battalion (with engineers, signals, and military intelligence), and a command sergeant major and a support battalion. Stryker brigade combat teams have a somewhat larger structure. 3,000–5,000 soldiers. Regiment: The Army, for the most part is no longer organized by regiments. Rather, battalions and squadrons maintain regimental affiliations in that they are called (for example), 1st Battalion, 8th Infantry (Regiment is implied) and is written 1–8 Inf. In this case, there is no regimental commander and the battalion is organized as part of a brigade for combat. The exceptions are those units, such as armored cavalry regiments which remain organized, and fight, as a regiment and have a regimental commander. The written designation is easy to distinguish and commonly misused. A "forward slash" ("/") separates levels of command. 1st Squadron, 3rd Armored Cavalry Regiment is written 1/3 ACR whereas the 1st Battalion, 6th Field Artillery (again, Regiment is implied) is written 1–6 FA. Battalion (or cavalry squadron): Normally composed of three companies, troops or batteries and led by a battalion/squadron commander, usually a lieutenant colonel supported by a command sergeant major and a staff in a headquarters and headquarters company/battery/troop. 300–1,000 soldiers. Company (or artillery battery/cavalry troop): Designated A to C (plus HQ or support companies/batteries/troops) when in a 3 company/battery battalion or A to D when organized in a 4 company/battery battalion. Regimental troops are designated A to T, depending on the number of troops. The troops are then divided into their like squadrons. Each company/battery/troop is composed of a company/battery/troop headquarters and three platoons, and led by a company/battery/troop commander, usually a first lieutenant, captain or sometimes a major supported by a first sergeant. 62–190 soldiers. Platoon: Composed of a platoon headquarters and three squads, led by a platoon leader, usually a second lieutenant supported by a platoon sergeant (sergeant first class). 42 soldiers. Section: Usually directed by a sergeant supported by one or two corporals who supplies guidance for junior NCO squad leaders. Often used in conjunction with platoons at the company level. 12-24 soldiers. Squad: Composed of two teams and is typically led by a staff sergeant or sergeant. 9 soldiers. Team: The smallest unit. A fire team consists of a team leader (usually a sergeant or corporal), a rifleman, a grenadier, and an automatic rifleman. A sniper team consists of a sniper who engages the enemy and a spotter who assists in targeting and team defense and security. 4 soldiers. Personnel in the Army work in various branches, which is their area of training or expertise. Traditionally, the branches were divided into three groups combat arms, combat support, and combat service support. Currently, the Army classifies its branches as maneuver, fires, and effects; operations support; and force sustainment. Basic branches - contain groupings of military occupational specialties (MOS) in various functional categories, groups, and areas of the army in which officers are commissioned or appointed (in the case of warrant officers) and indicate an officer's broad specialty area. (For example, Infantry, Signal Corps, and Adjutant General's Corps.) Generally, officers are assigned to sequential positions of increasing responsibility and authority within one of the three functional categories of the army branches (Maneuver, Fires and Effects; Operations Support; Force Sustainment) to develop their leadership and managerial skills to prepare them for higher levels of command. The branches themselves are administrative vice operational command structures that are primarily involved with training, doctrine, and manpower concerns. Each branch has a Branch Chief who is the Head of the Branch and usually serves as the respective branch school commandant or director. Special branches - contain those groupings of military occupational specialties (MOS) of the army in which officers are commissioned or appointed after completing advanced training and education and/or receiving professional certification in one of the classic professions (i.e., theology, law, or medicine), or other associated health care areas (e.g., dentistry, veterinary medicine, pharmacy, registered nurse, physician's assistant). Officers of most special branches are restricted to command of units and activities of their respective department/branch only, regardless of rank or seniority. This means, for example, that Army Medical Department (AMEDD) branch officers may only command AMEDD units and activities. Likewise, Chaplains are essentially "officers without command" and are ineligible to command operational units and activities. They do, however, supervise junior ranking chaplains and enlisted chaplain's assistants. As an exception to this general rule, JAG Corps officers are eligible to command and may be assigned (with permission from the Judge Advocate General) to non-legal command positions, although ordinarily, like other Special branch officers, a JAG officer will only lead JAG Corps units and activities during their career. The Civil Affairs/Military Government Branch in the Army Reserve Branch was established as a special branch on 17 August 1955. It was subsequently redesignated the Civil Affairs Branch on 2 October 1955, and it has continued its mission to provide guidance to commanders in a broad spectrum of activities ranging from host–guest relationships to the assumption of executive, legislative, and judicial processes in occupied or liberated areas. Became a basic branch effective 16 October 2006 per General Order 29, on 12 January 2007. ^ See the Continental Staff System for an explanation of "letter-number" (e.g. G-8) designations. ^ "World War I". Archived from the original on 30 August 2009. Retrieved 28 June 2009. ^ "DCS G2, HQDA". army.mil. Archived from the original on 22 May 2015. Retrieved 23 April 2018. ^ "U.S. Army Central - www.usarcent.army.mil". www.arcent.army.mil. Retrieved 23 April 2018. ^ "SETAF Takes on a new mission" (Press release). United States Army. 10 Dec 2008. ^ "SETAF assumes new mission as Army AFRICOM component" (Press release). United States Army. 13 Jan 2009. ^ "LeBoeuf selected as USARAF deputy commanding general". ^ Myers, Meghann (1 September 2017). "US Army Africa commander suspended, under investigation for sending suggestive messages to soldier's wife". ^ "Commanding General, United States Army Africa". usaraf.army.mil. Archived from the original on 15 May 2016. Retrieved 16 May 2016. ^ News, A. B. C. (13 October 2017). "Two-star Army general relieved from duty for alleged inappropriate contacts". ABC News. ^ a b c "Army Birthdays". United States Army Center of Military History. 31 July 2009. Retrieved 1 June 2010. ^ Jannie Zaaiman; Louise Leenan (24 February 2015). Iccws 2015 - The Proceedings of the 10th International Conference on Cyber Warfare and Security: ICCWS2015. Academic Conferences Limited. pp. 123–124. ISBN 978-1-910309-96-4. ^ "Department of the Army Pamphlet 600-3 (DA PAM 600-3), Commissioned Officer Professional Development and Career Management" (PDF). 1 February 2010. p. 54 (as printed on the source page). Retrieved 29 November 2018 – via http://dopma-ropma.rand.org. ^ "History". goarmy.com. Retrieved 23 April 2018.